over labor day weekend, we spent the day visiting ryan's parents on saturday. 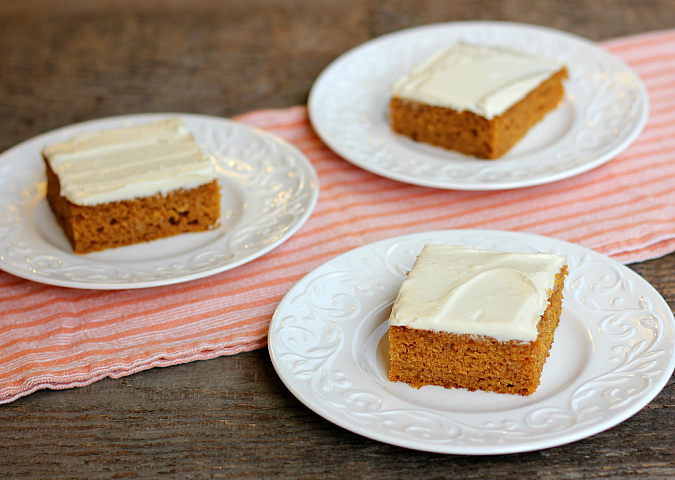 while we were there, ryan's mom had made a pumpkin cake with cream cheese frosting for dessert. 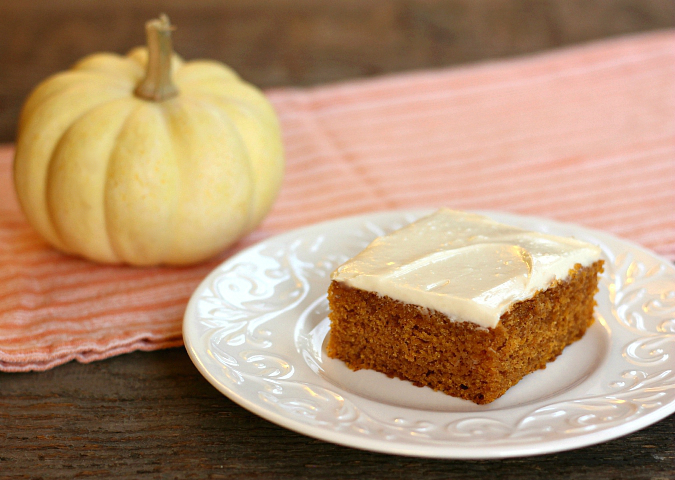 our family absolutely loves pumpkin desserts, especially during the fall months, and this cake was the perfect treat to kick off the fall season. this cake is absolutely divine! 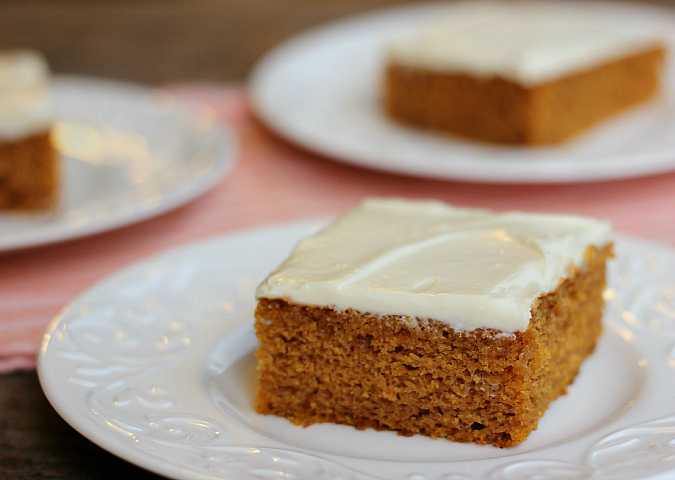 the cake itself is light and fluffy, and it has just the right amount of spice from the cinnamon without being overpowering. it is a gorgeous orange color too. 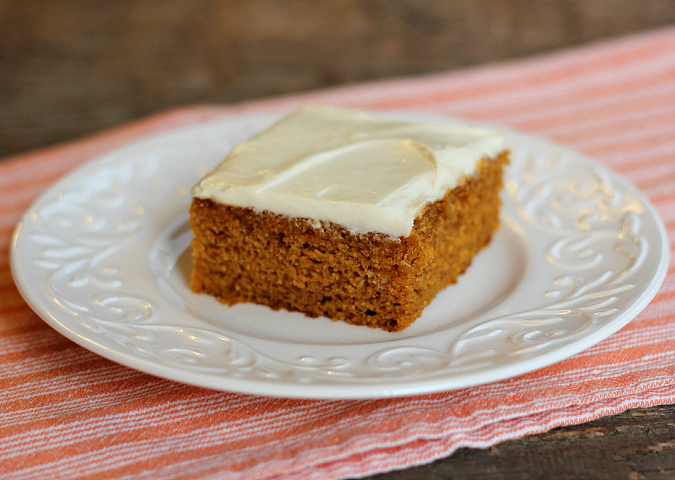 the cake by itself isn't too sweet which makes it a perfect compliment to the sweet cream cheese frosting. 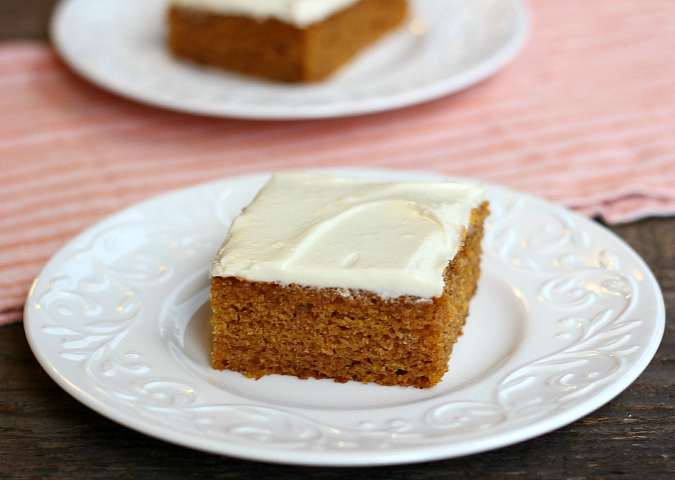 the cream cheese frosting is rich and sinful, and so smooth and velvety. ryan's mom sent us home with leftover cake and we were super grateful for that. we have been savoring it all week for dessert after dinner. yum! preheat your oven to 350 degrees F. to make the cake: in the bowl of a stand mixer fitted with a paddle attachment, combine the eggs, sugar, oil, and pumpkin. beat until well blended. in a separate bowl, sift together the flour, baking powder, baking soda, salt, and cinnamon. gradually add the sifted dry ingredients to the pumpkin mixture. mix well to combine. pour the batter into an ungreased 15 x 10 x 1-inch baking pan. bake for 25-30 minutes, until set and a toothpick inserted in the cake comes out clean. allow the cake to cool completely before frosting. to make the frosting: in a stand mixer fitted with a whisk attachment, combine the cream cheese, butter, powdered sugar, and vanilla. mix to combine. add milk gradually to achieve desired consistency and thickness. spread the frosting over the cooled cake and store the cake in the refrigerator until ready to serve. I'm glad you liked it so much; we thought it was really yummy, too! I will definitely make it again. I will be over for a piece of cake and a cup of coffee. Looks delicious. I love anything pumpkin. This time of the year it is hard to stay on a diet.